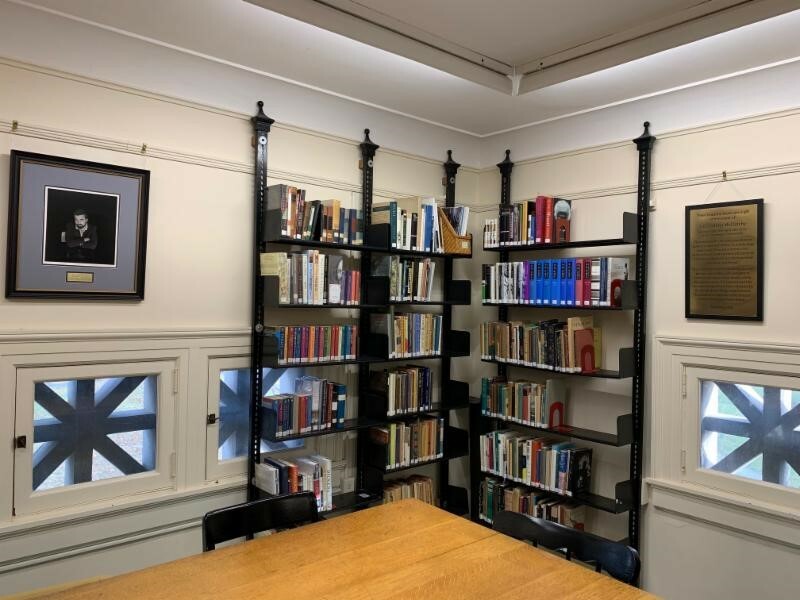 We are very excited to announce that The J. D. McClatchy Memorial Corner in the Library Gallery is completed. 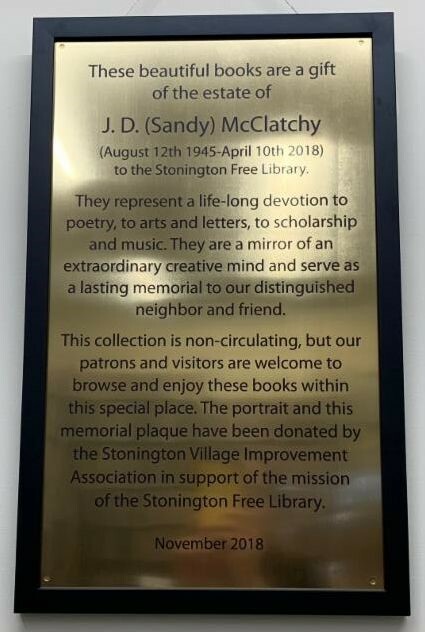 Our patrons and visitors are welcome to browse and enjoy this unique collection, a gift of the estate of J. D. (Sandy) McClatchy (August 12th 1945-April 10th 2018) to the Stonington Free Library. This collection is non-circulating, but can be explored and enjoyed within this special place. These beautiful books represent a life-long devotion to poetry, to arts and letters, to scholarship and music. They are a mirror of an extraordinarily creative mind and serve as a lasting memorial to our distinguished neighbor and friend. Our heartfelt thanks go to Chip Kidd who offered the Library the opportunity to become a permanent home for Sandy’s books. Also, it is with great gratitude that we acknowledge the guidance and advice of Sandy’s friend and colleague, Professor Jonathan Post, in selecting these books and the support of the Stonington Historical Society and the Merrill House for this project. 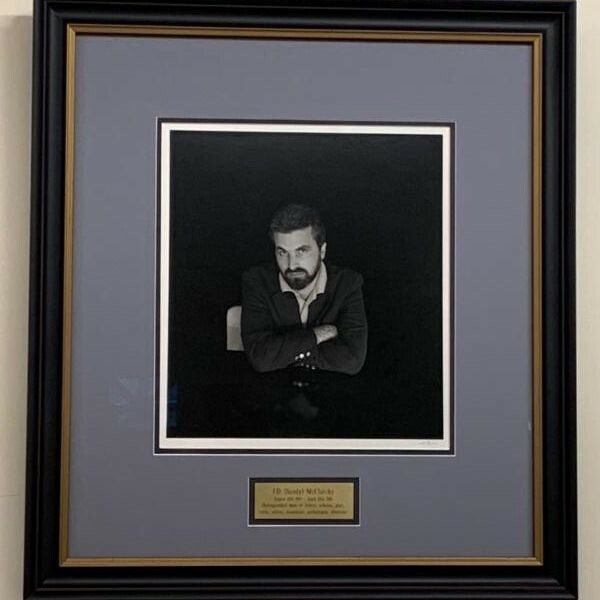 Lastly, we thank the Stonington Village Improvement Association for their generosity in donating the beautiful memorial plaque and the framing of the photograph and thus making this special corner of the Library both a fitting tribute and a place of thoughtful rest for all comers in perpetuity. 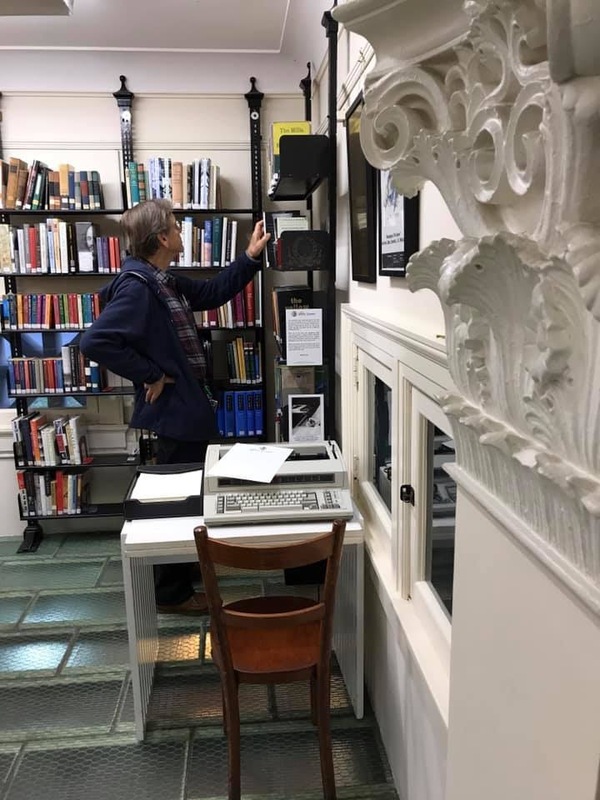 Library patron and Stonington resident Robert Palm has most generously donated Sandy McClatchy’ s typewriter to the Library to be a part of the McClatchy Memorial Poetry Corner. 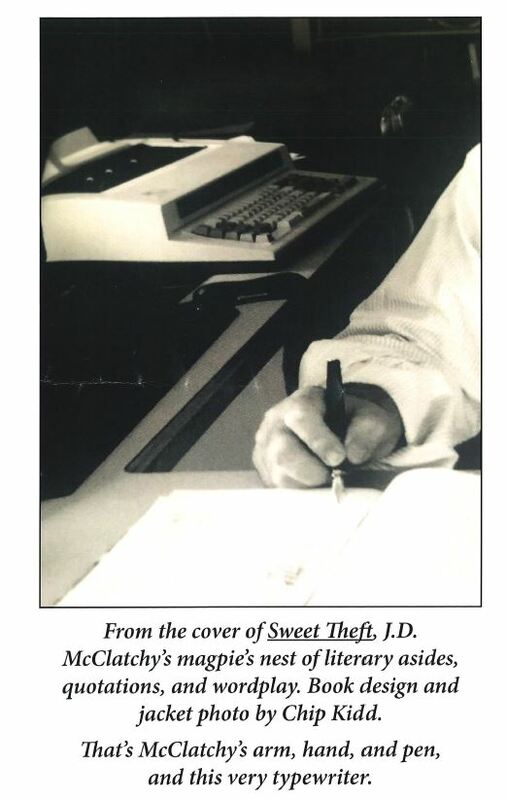 Along with the typewriter goes an invitation to browse the books from Sandy’s library that are on the shelves and then write a poem of your own. To take part in the Poet’s Corner competition leave your poem at the desk with your name and email address. Every few months the poems will be read and judged. 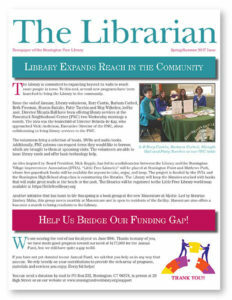 The winners will be published in the Library newsletter. Margaret Gibson, the newly appointed Connecticut Poet Laureate, has kindly agreed to take on the role of judge for the first year. Robert has provided all that is needed to make this project complete – table, chair a supply of specially printed paper and, amazingly, even typewriter ribbons!